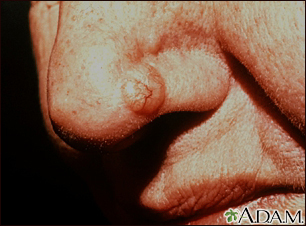 The typical basal cell skin cancer appears as a small, pearly, dome-shaped nodule with small visible blood vessels (telangiectasias). This skin cancer appears as a 2 to 3 centimeter skin spot. The tissue has become destroyed (forming an atrophic plaque). There is a brownish color because of increased skin pigment (hyperpigmentation) and a slightly elevated, rolled, pearl-colored margin. This growth is located along the hair line. This skin cancer, a basal cell carcinoma, is 5 to 6 centimeters across, red (erythematous), with well defined (demarcated) borders and sprinkled brown pigment along the margins. This cancer is located on the person's back. This flesh-colored, verrucal, pearly, smooth, non-scaling papule is a basal cell carcinoma. It is occurring in a common, sun-exposed area of the face, on the forehead. This basal cell carcinoma appears as a multicolored flat lesion, with a periphery that has ulcerated and bled. Telangiectasia are present. 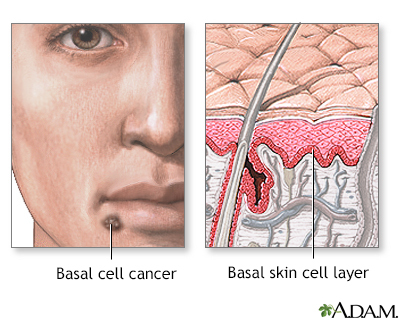 Basal cell cancer is a malignant skin tumor involving cancerous changes of basal skin cells. Basal cell skin cancers usually occur on areas of skin that are regularly exposed to sunlight or other ultraviolet radiation. Once a suspicious lesion is found, a biopsy is needed to prove the diagnosis of basal cell carcinoma. Treatment varies depending on the size, depth, and location of the cancer. Early treatment by a dermatologist may result in a cure rate of more than 95%, but regular examination by a health care provider is required to watch for new sites of basal cell cancer.